I was really looking forward for this trip to Priecne Sedlo. For all I knew it looked very promising. A real adventure out in the mountains. And I wasn’t wrong. 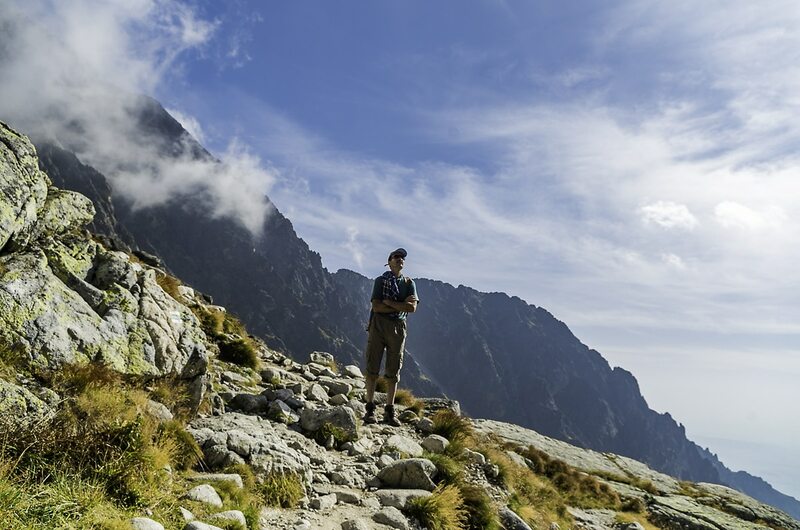 This trail in High Tatras was an adventure with all the good and bad things real adventures come with! Our intention was to start with a small trail on the first day, then go bigger and bigger until on the 4th we would go for the one that we really came for. Priecne Sedlo. 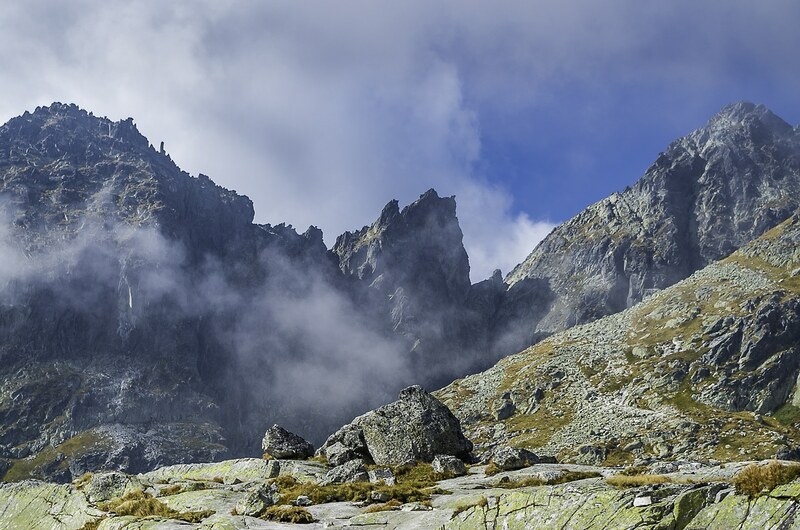 A high pass south of Maly Ladovy peak. 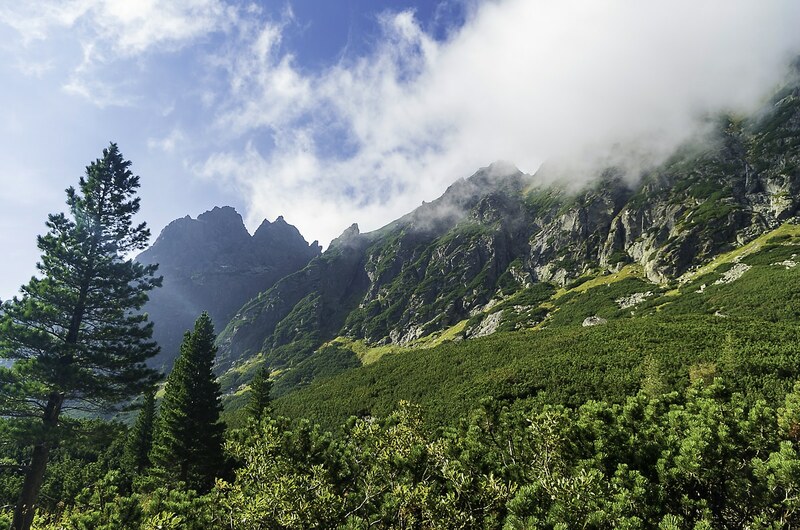 The plan was to drive to Stary Smokovec (1010m), early in the morning and from there take the railway to Hrebienok (1290m) where we would start our ascend by trekking the Mala Studena dolina (valley), all the way to Teryho Chata (2015m) and carry on to climb Priecne Sedlo (2352m), the highest point of our trail. 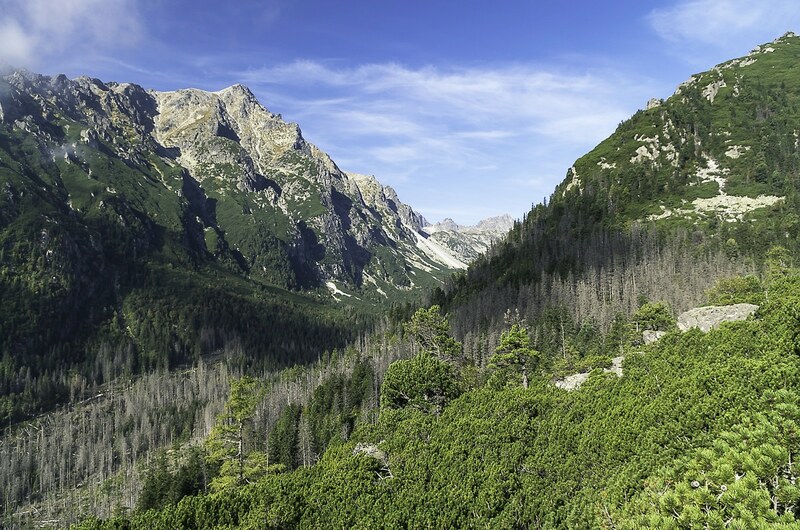 From there we would pass to Velka Studena valley and after a brief stop at Strelecka veza for lunch we would descend back to Hrebienok. It sounds challenging, and it is. 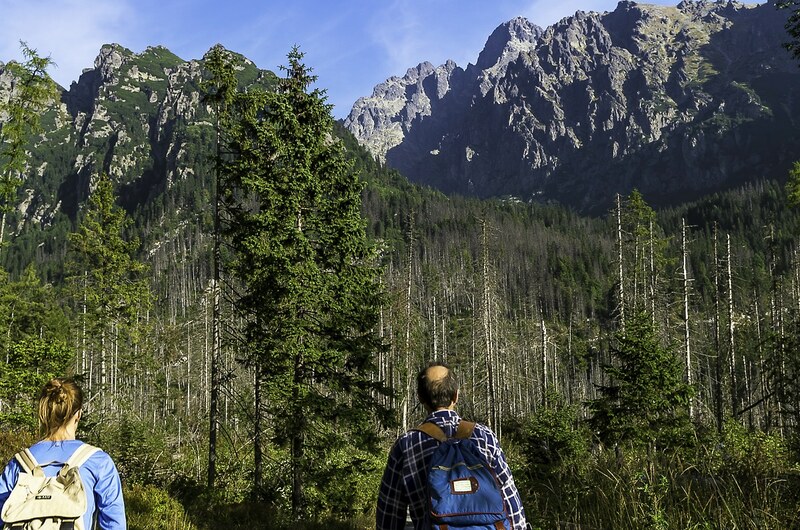 It’s a high difficulty trail and if you want to hike it without spending the night in Teryho or Zbojnicka chata, it means 9 hours of rough terrain with steep uphills and downhills plus rock climbing in Priecne Sedlo. We were confident though. And by we, I mean me, my partner Veronika and her father Marian. I suppose I was the weakest link since they had climbed the same route before, plus they are much more experienced mountaineers than I am. But I’m no slouch either. I had completed a half marathon race in 2 hours flat, less than five months ago. So, I thought it would be fine. Actually I was more worried about Veronika because she had the flu for the past 3 days. How wrong was I? The first day, we arrived late so the only trail we could go for, was a small one to Plesnicev chata and back. It took us 2 hours and it was barely a warm up. 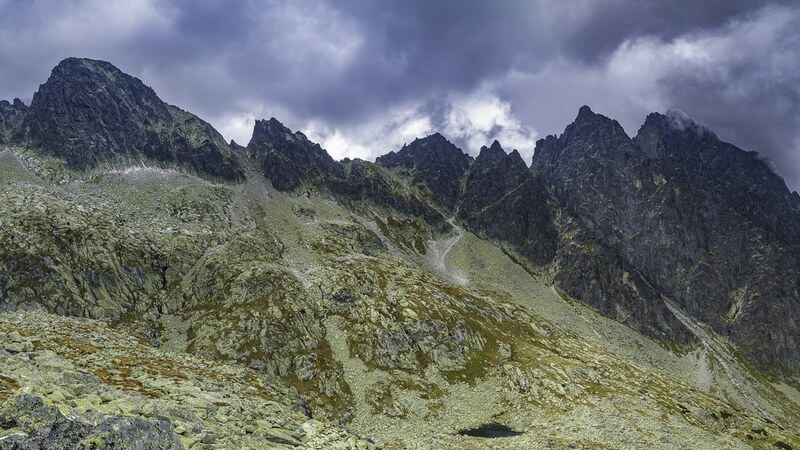 After we went back to our rooms, we checked the weather and found that it was changing for the worst (pretty common in High Tatras, the weather is very unpredictable). So we probably had only one day of good weather. The next one. After we talked about it, we agreed to go for Priecne Sedlo the next day. Because if we delayed more, the pass could close. Something that happens often. Next morning we arrived in Stary Smokovec by 08:00, but had to wait until 08:30 for the rail which was departing every half an hour. 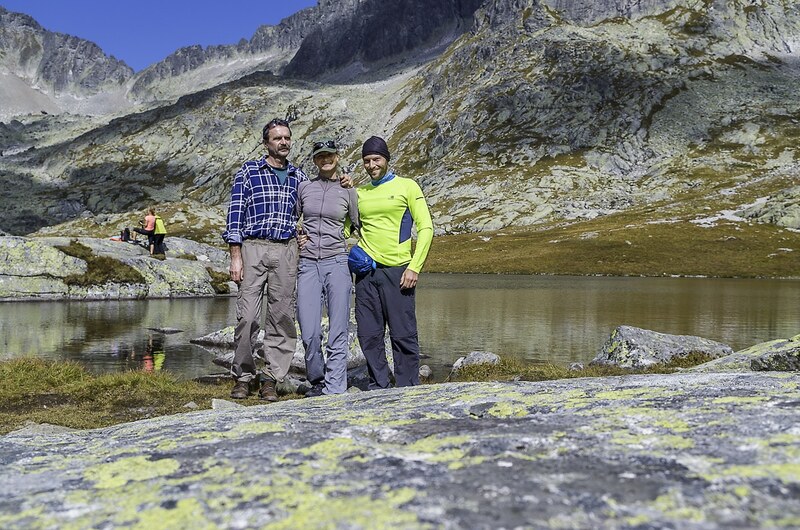 The Slovaks have a great hiking culture, so it was crowded, many children too! Some of them so young they were being carried on the backs of their parents. 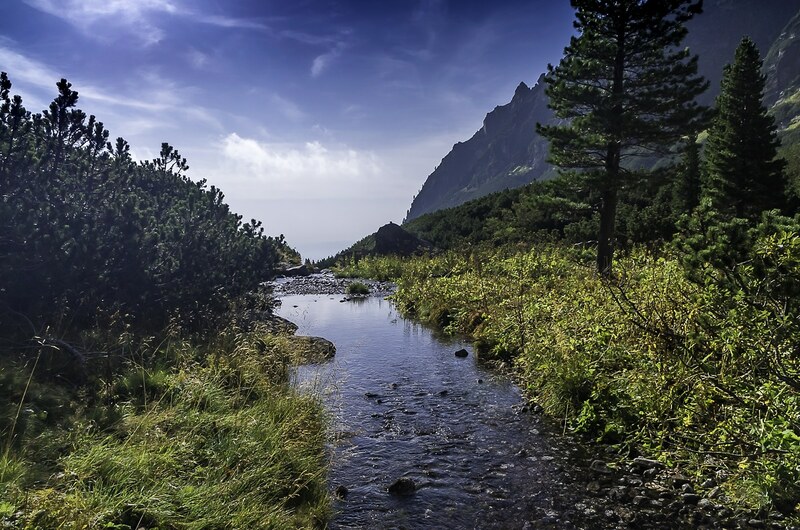 It took us less than ten minutes to get to Hrebienok and there, I had the first real glimpse of the Tatras majesty. 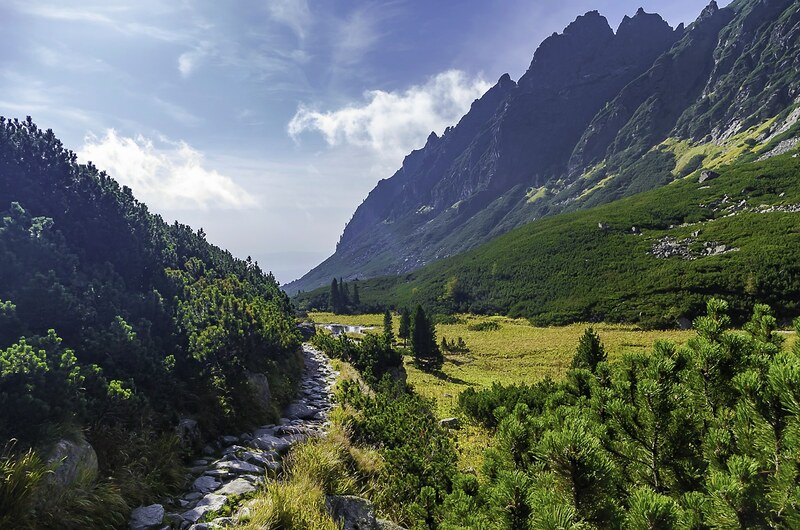 High Tatras have a tree line at about 1600m. That’s the highest altitude that a tree can grow in the area. 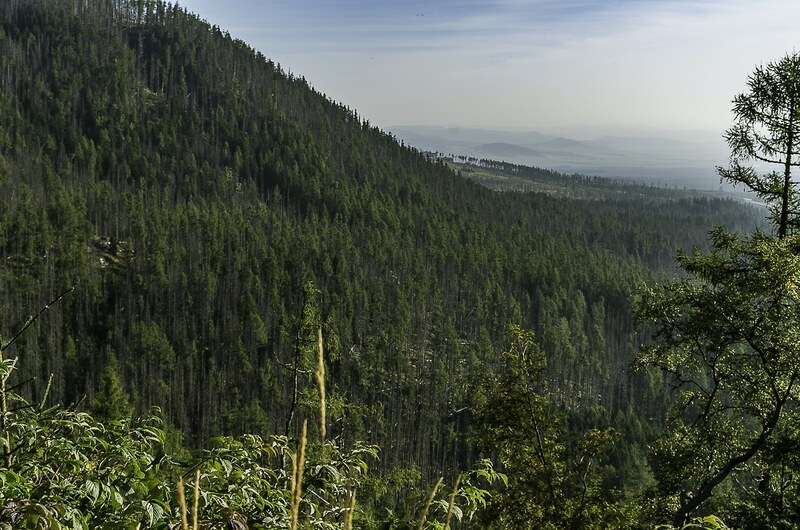 And even though a very destructive windstorm destroyed at least one third of the forest in 2004 and left massive scars, it is recovering with the help of the locals. I took a deep breath of fresh air and started. Veronika and Marian at the front, and me constantly falling behind shooting photos. So basically they had a steady pace and I was standing for a moment and then running to catch up the next. Tiring but the scenery was stunning. The weather was slightly cloudy but warm. Perfect for hiking and photography. We were walking through a forest, on a mountain, next to a stream, passing small waterfalls, small wooden bridges and all kinds of flora! 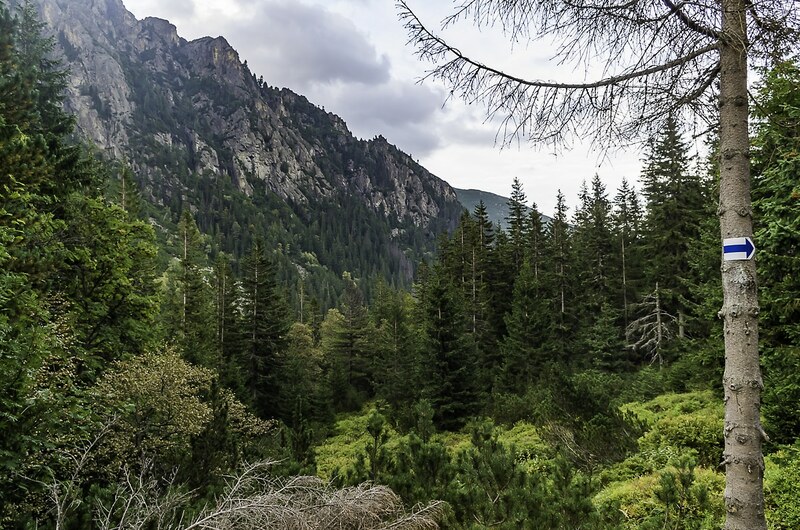 There were moments when I really stopped and gazed above the tree tops, where I could see the towering mountains on the sides of the valley, clean of any vegetation, dressed in granite. It was overwhelming. As we walked further on, the trail became steeper and the temperature higher. Having dressed in layers, I had to take some off because I started sweating. Other than that, everything went as I hoped it would. The weather was ideal and our pace was good. After an hour of trekking we left the forest behind. It was then that I started to feel a small discomfort at my stomach. I was so absorbed that I didn’t pay attention though. Teryho chata could be seen maybe 350m above us and I could tell that the final section would be brutal. This is one of the steepest parts of the route and it would take us another hour and a half. So we marched on. The trail was becoming steeper and steeper and my discomfort greater and greater with each passing minute. 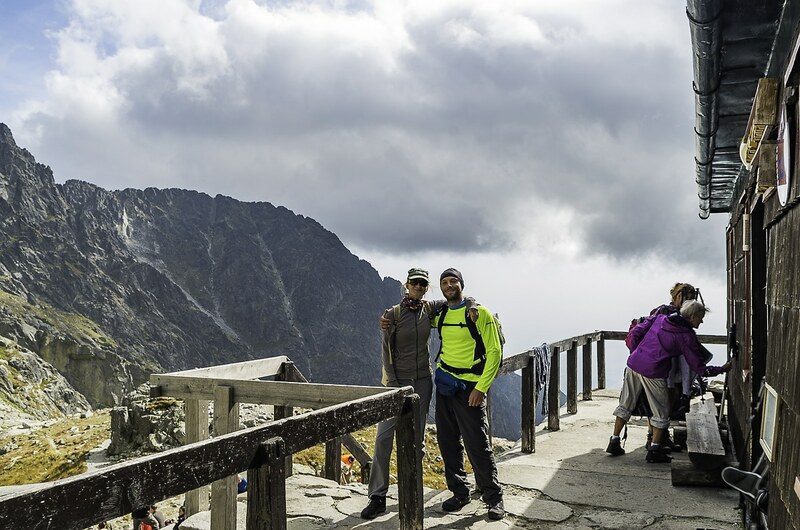 Even though I knew we were almost there, I told Marian and Veronika that we had to make a stop because my legs were really stiff and I had started to experience a little dizziness along with an upset stomach. Marian told me it was probably the altitude that got me and I agreed because it felt like altitude sickness. For the remaining 15 mins to Teryho chata, I was trying to take a decision. Should I let the others go ahead and turn back to Hrebienok, or not? Yes, it was that bad and I didn’t want to ruin it for the others as well. At least Veronika was in great shape and feeling better than all the previous days. In conditions like these you have to work with your psychology first. If you succeed, the body hopefully will follow. Priecne Sedlo is a one way road. Once you commit to it there is no turning back. You have to climb it to the end. Many times climbers had to get rescued while attempting it. Did I tell you that Slovaks actually charge you for your rescue operation? And that’s a happy ending, people have died there in the past. With my legs burning. Eventually I made it to Teryho chata. I was feeling exhausted and Marian proposed to stop for 45 minutes and eat something. I was probably looking like a corpse at the time. I laid on a rock for 10mins just to get myself together. When I eventually caught my breath, I raised my self and had a look around. What a place! Terry’s cottage as it translates in English, is a mountain refuge located at the end of Mala Studena valley on a plateau at 2015m. 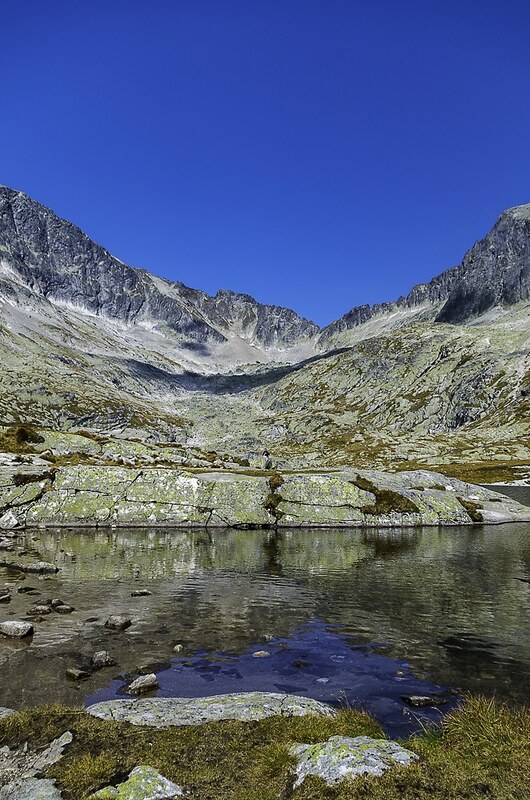 Three small lakes called “pat spisskych plies” are next to it, and it is surrounded by mountains from every direction but south. It is beautiful in a way only alpine sceneries can be. Since it’s a middle stop for many trekkers, it’s crowded. But at the same time it is peaceful, serene and quiet. Most people just sit by the lakes and watch the surrounding nature in amazement. It is a piece of landscape art. And you can spend your night there if you book early. Or you can crash on their floor for a small fee if it’s fully booked. I can only imagine its beauty in the night under a starlit sky. Maybe next time. After I had a light lunch and some tea, I felt much better. I wasn’t 100% but my head was better and my stomach as well. I talked with Veronika about my situation and she told me that this would be a rare opportunity and I should go for it. Inside me I knew that if I backed off, I would regret it bitterly. So I decided to carry on to Priecne. Thirty minutes later we were at the base looking up the chain lines disappear into the clouds! 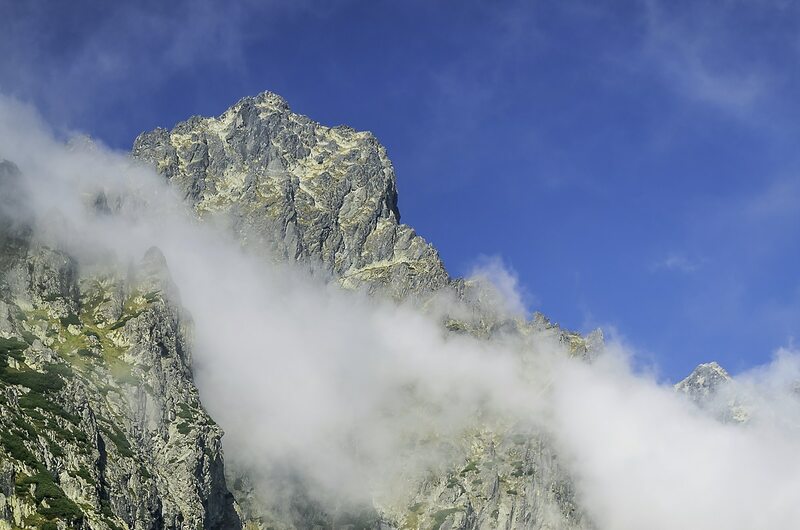 A thin cloud layer was at around 2200m obstructing the view to the top of Priecne Sedlo. Many people were already climbing or waiting at the base, to start. There wasn’t a queue but still it was impressive to see so many people. As I said earlier Slovaks really have a mountain culture. Veronika climbed this pass when she was twelve for the first time. All by herself and Marian just climbing behind her, only to give her instructions. The climb started gradually Veronika was first, me in the middle and Marian right behind me. There were many spots that the chain wasn’t really necessary. But Marian told me to always keep one hand on it for safety. He also advised me to lean back when I was using it, which was a little scary but really made life easier. I was feeling more confident than before. I had never attempted climbing at such height and without a safety line attached to me! But everybody was so casual about it that I became comfortable too. I even looked down on many occasions but shooting pictures was next to impossible. My Pentax was attached to my backpack with two carabiners at the shoulder straps and I had dropped it behind my head so I wouldn’t scratch the lens on the rocks. In order to shoot I had to stop, release one hand, get the camera in front of me and shoot. In the meantime everybody behind me had to wait. We were going up steadily for around half an hour already. As I was climbing higher and the clouds started to dissipate, I could see for the first time where the top approximately was. I felt tired but nothing would stop me from reaching the top. 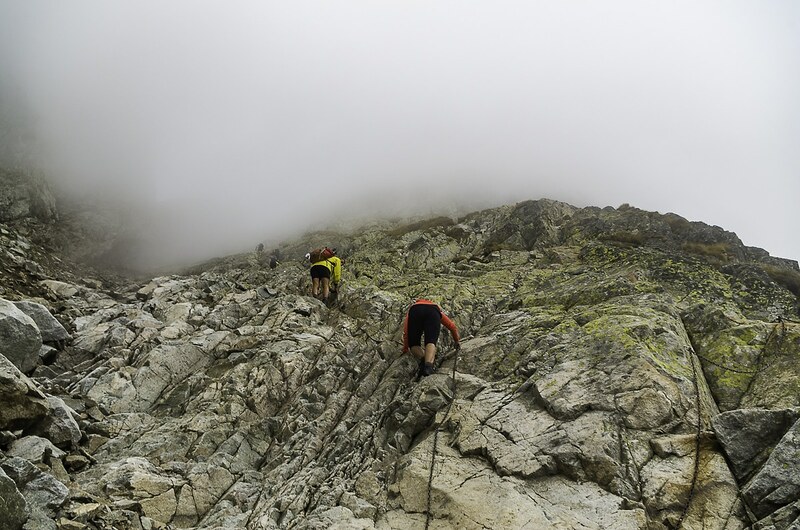 We were at the third quarter of the climb and I was lifting my left leg to place it to the next foothold when I felt this intense pain going through my bicep like a knife. In the meantime all 30 people climbing the same line with me came to a halt. I thought to try another foothold with my right foot this time. This one was even higher and I would have to bend my right leg even more. The moment I bent my knee and raised my foot, my right bicep this time turned into rock and the pain made my whole leg numb. Alright. Now I could visualize the rescue officer handling me that 10.000€ bill. Not to mention the embarrassment. So there I was. No way going up and of course no way going down. I could stretch one leg at a time but any attempt to bend my knee turned into agonizing pain and a numb limb. Marian told me to take it easy and just wait for it to pass. I tried to massage the muscle but to no avail. Veronica kindly reminded me that there was a bunch of people waiting for me. She pointed to a ledge above me I should try to climb to. So finally I could get out of the way. There we would think what to do. She was right but I couldn’t move even half a meter not to mention three, in order to get up there . To everybody’s credit no one complained or said anything at all. They all waited very patiently and nobody rushed me into anything. However there was no choice. I had to go somewhere. If I could get past that relative smooth granite surface that was in front of me, then I could use my legs and climb with small movements . To do that, I would do something that I shouldn’t, under normal circumstances. I grabbed the chain with both hands, completely removed both my legs from the rock and climbed up the chain with great effort lifting me and my backpack. That was enough to climb up a meter, to a place where I could use my legs again. Pain or no pain by making small movements and after a couple more pauses I managed to get to the ledge where I could sit and get out of the way. One of the people that was climbing behind us stopped and asked Marian and Veronika what was wrong. After they told him, they all agreed that I was dehydrated and that I had the cramps because I needed Magnesium. They were right but how did this slip my attention entirely? 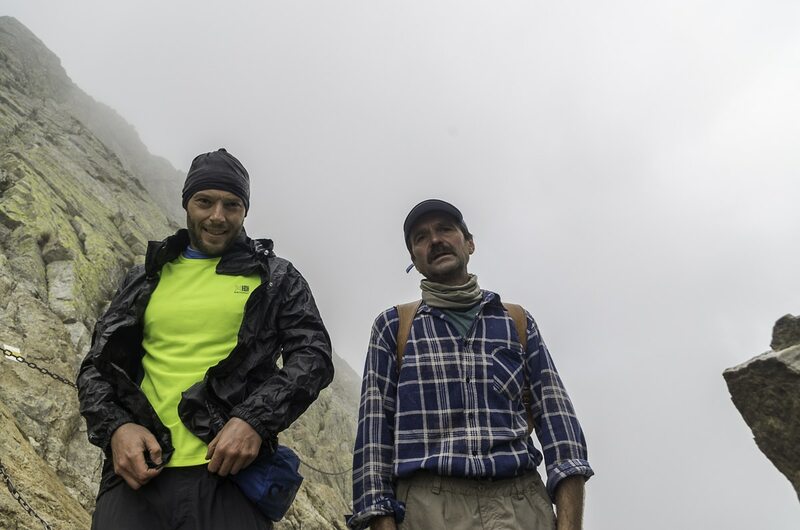 He said that his father who was climbing last after the whole family, was always carrying Magnesium with him. But that would take same time. There were 20 people between me and him. I thanked Vladislav (I hope I remember his name correctly) and sat down while he started his ascend again. “Don’t get started before the 20 minutes pass”, he shouted from above. And I assured him I wouldn’t. Ten minutes after, I began to feel a little better. The muscle spasms were milder and the pain seemed to go away. I wouldn’t need that rescue after all! A bit more waiting and I felt good enough to stand up. It was difficult. My legs were cold and I could feel numbness on both of them, plus they were trembling. I shouldn’t be siting for the whole time. How stupid of me. Anyway I started some warm up on the spot and that improved the situation enough to get me going since the others had gotten cold as well. They offered to carry my backpack but I only gave to Marian a thermos full of tea to lighten a bit. And so we started climbing again and it wasn’t long after that we set foot on top of Priecne Sedlo. I was feeling broken and depleted but what a view! Spectacular on both directions. I was thrilled that I made it, one way or another. I had this calm warm feeling you get when you overcome something bigger than you. From there on, it was mostly downhill but I still had almost five hours of trekking and I was already struggling. Well. There was only one way. Keep walking. On the way down I saw Vladislav and family again, taking a break on the side. We had a small chat. I thanked him again, took his picture and went on our way. What a nice fellow. 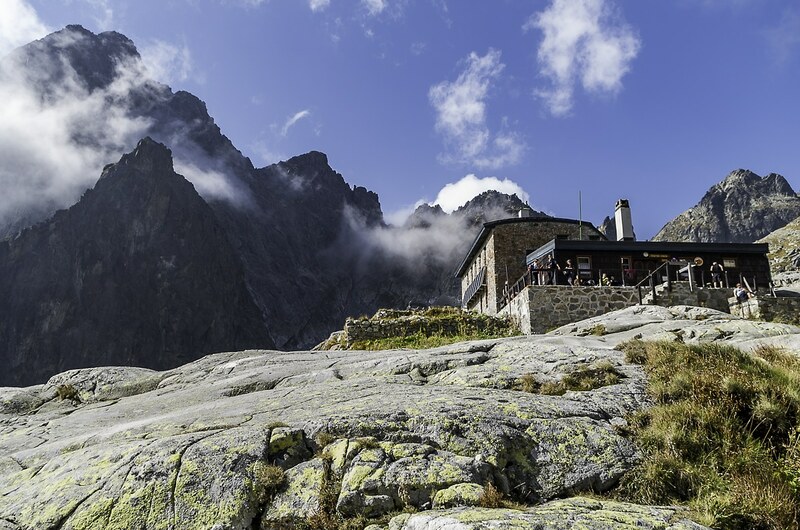 Before descending entirely to Velka Studena’s valley bottom, Marian said that we could stop at Strelecka veza for lunch. 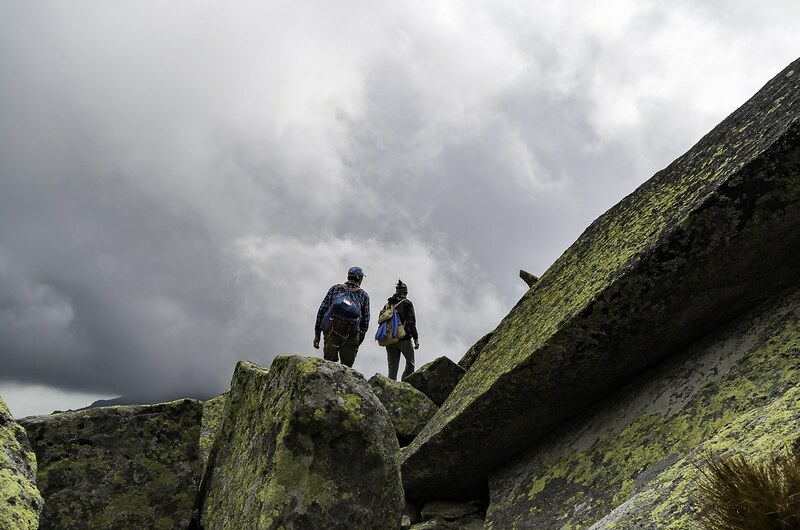 That’s an impressive hill consisted of huge granite boulders many looking like menhirs which are covered in a green moss that gives landscape a pistachio color when observed from a distance. We had to ascend a bit in order to get on top of it but it was really worth it. The view was astonishing. The top of it, is a piece of rock no bigger than 4 square meters. There was just enough space for the three of us. 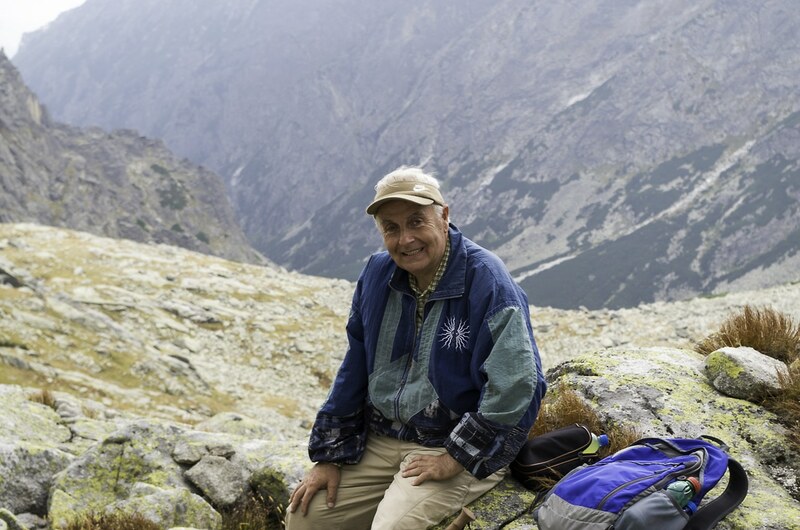 We had our lunch surrounded by clouds and mountain peaks except for the south east side where we could see beyond the valley exit, the plains around Stara Lesna. Next stop was Zbojnicka chata. Another refuge down the valley where we sat again for a tea and a shot of rum. Marian tradition. Is it advisable to have alcohol after serious dehydration especially when you still have another two hours to walk? I don’t think so but I had it anyway. The next one hour and a half was a relative easy hike to Hrebienok. 15 minutes before we got there, came across a small trail leading to some beautiful waterfalls called Vodopad Studeneho potoka. We were planning to make this small detour and see the place but now I wasn’t sure. In the end I said that since I had gotten so far I could go on for another half an hour. The short trail led us straight to the waterfalls in the forest which were indeed amazing! But after we were done with them, we had to walk for another 15 minutes up to Hrebienok. That was my coup de grâce. Five minutes after we started my powers abandoned me entirely. I had to stop every five steps and gasp for air, like if I was climbing Everest. I couldn’t even reply to Veronika when she asked me if I was alright. I had given it all, there was nothing left. My ego was also dead so I gave them my backpack and my camera. It was with strong effort that after twenty miserable minutes we reached the funicular station. When I saw the bear statue outside I took a deep breath because I knew that our trip was finally over. I won’t bother you with the details. I will only tell you that when I woke up the next morning, my heart was still racing at 100 BPM and I had one toenail less. I took a huge breakfast and went to bed for another 3 hours. The fact that I didn’t have heavy legs or muscle fever the following days just proves that my main problem was dehydration and consequently I had brought this to myself. I completely misjudged my liquid consumption even though Veronika was complaining all the time that I didn’t get enough water. When I finally realized that, it was too late. My body was in shock and no matter how much water I consumed, things were going downhill. I skipped the worst for two reasons. The first is that I was in top shape so I was able to stretch my limits. And second but not least, I had two great companions with me who helped me a great deal. Psychology is everything in a situation like this and the fact that they were with me, reassured me and gave me confidence. Priecne Sedlo was one of the best and worst days in my life. In this order. 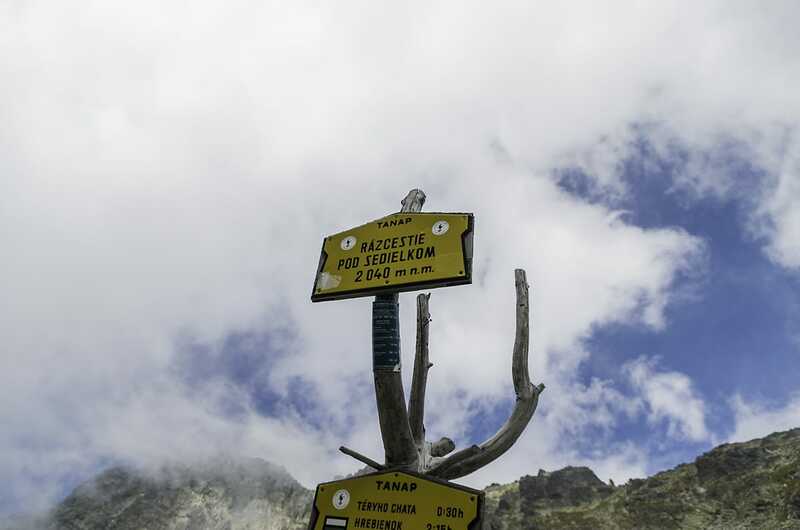 It really saddened me when I read on the news that two Latvian hikers died ten days after, probably from hypothermia. Mountains are not playgrounds. You have to respect them otherwise you may pay dearly. Would I do it again? Absolutely yes! Would you Like to Subscribe to Our Notifications? travel and photography with friends and anybody who has the same passion. If you liked this story subscribe and read all the new stories first. Dehydration and rum sounds like a heady combination! I’m very jealous of this adventure, your photos are amazing. Oh Gosh!! I was reading it like nice mountain story until I’ve reached part about cramps, struggle and dehydration! Good to have people around sometimes. 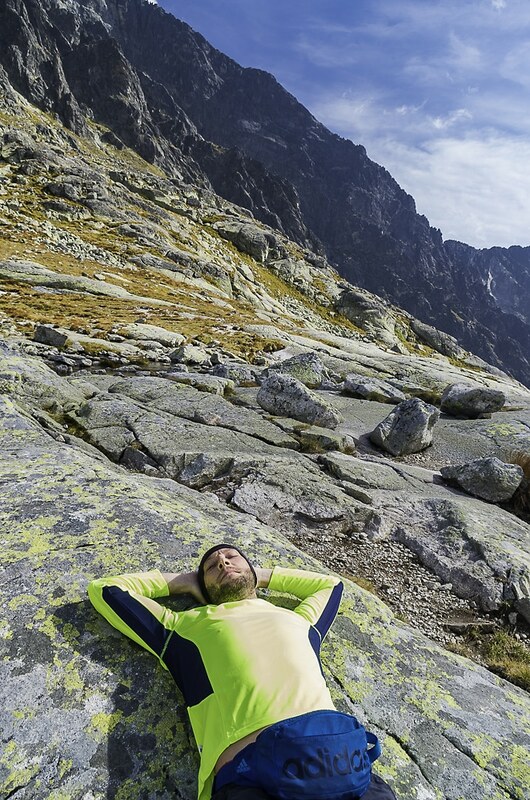 (even if we don’t like queues in Tatras at all!) Respect that you finished the path anyway. We did the same over a year ago and we can say it wasn’t an easy one. 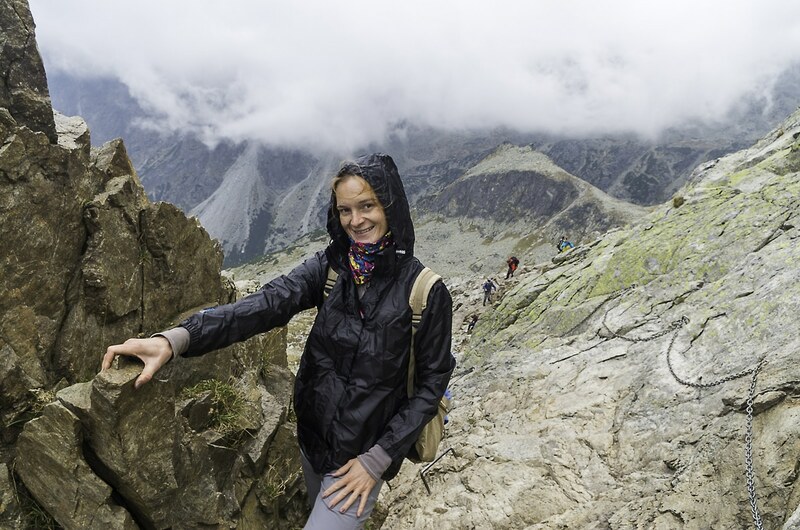 If you like hiking and even more extreme have you heard about Orla Perc on polish side at all? If you need any advice feel free to ask us, we explored lots paths on polish side. Cheers Guys and keep going! We really like your blog! Hey. Thank you for your time to read it. Mountains demand respect. Their beauty can be deceiving sometimes into making you think they are safe but that’s not always the case. I have heard of Orla Perc but haven’t explored the Polish side yet. Definitely in our plans though. When the time comes I will need all the info I can get. Thank you. Amazing story. 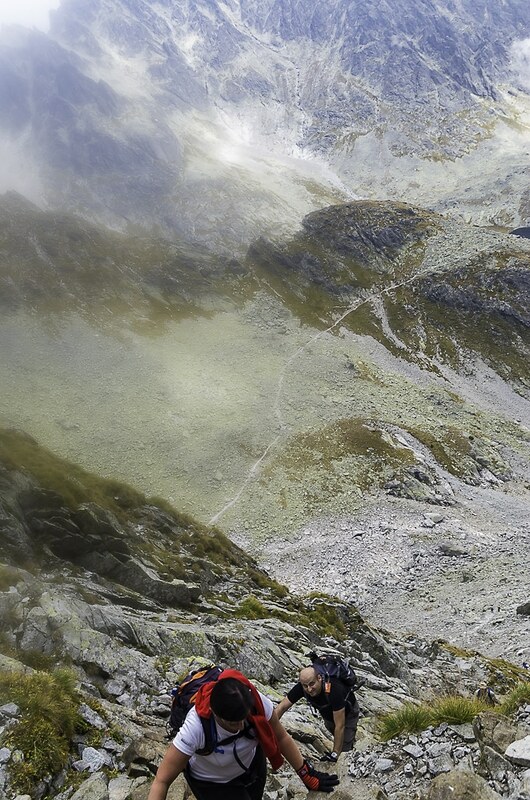 We never got to do this route due to my unexpected spell in Poprad hospital, but we will try to do it on our return in Sept 18 (although it looks a bit scary for me – I just won’t look down when doing the chains!!) fabulous photos, so glad I discovered your blog. All the best for 2018! Thank you! It is a great route but needs caution. And get all the new stories first. © 2018 Trip & Trail. All Rights Reserved.